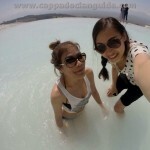 One of the most lovely place to visit in Turkey is Pamukkale with its magical experience of viewing the pristine travertines of Pamukkale along with the extensive ruins that constitue what was the ancient Greco-Roman city of Hierapolis. 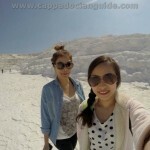 The travertine terraces were formed by running spring water at a temperature of 35C. 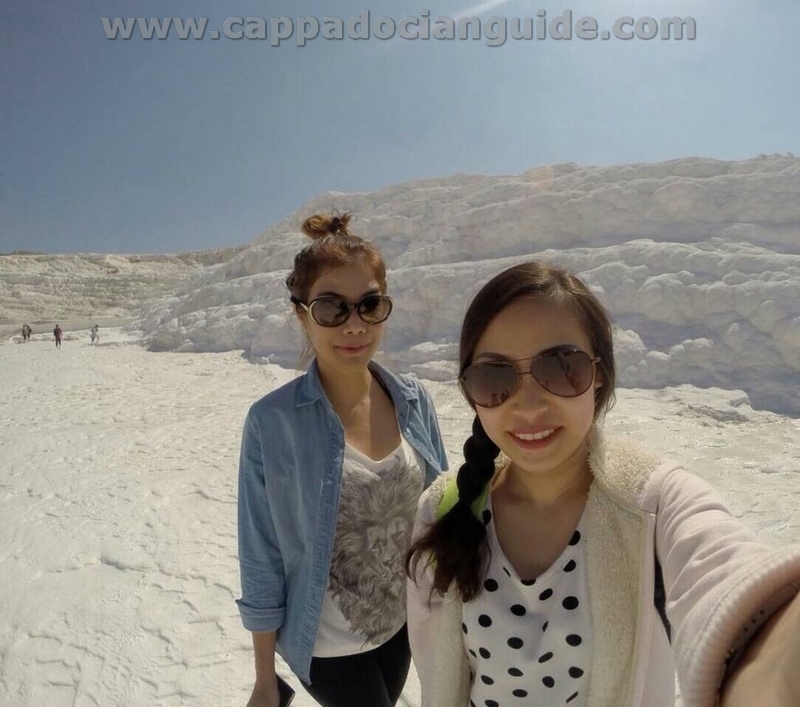 Estimated to be 14,000 years old, the water is concentrated with calcium bicarbonate that becomes limestone after the carbon dioxide evaporates. The limestone takes on a magical appearance with the water changing hues from brilliant blue in the sunshine to greys and green when the weather is overcast, Pamukkale to the Turks means “Cotton Castle” which is obvious when you see these wonderous masterpeices of natural beauty. Nearby is the town of Karahayit with even warmer thermal pools however the water at this location is red because it contains even less carbon dioxide gas than the travertines at Pamukkale. 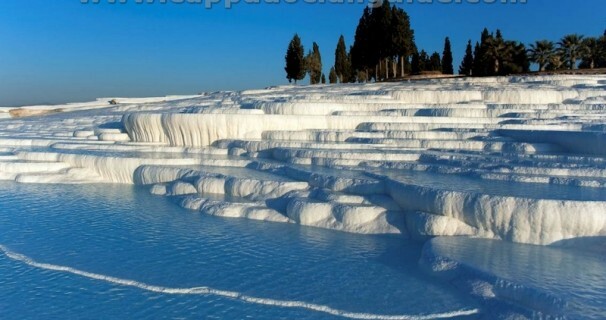 Hierapolis built by the ancient Greeks around 2BC occupies the surrounding area of Pamukkale. It was brought under the protection of UNESCO as a World Heritage site and is renowned for its extensive Necropolis and thermal pools that have been used since antiquity for the waters healing properties – today it is considered a spa with visitors luxuriating in the open air of Cleopatra’s pool. You will take a night bus from Cappadocia around 21:00pm and after 10 hours trip when you arrive in Denizli we will meet you at busstation and drive you (15km distance) to your hotel in Pamukkale. 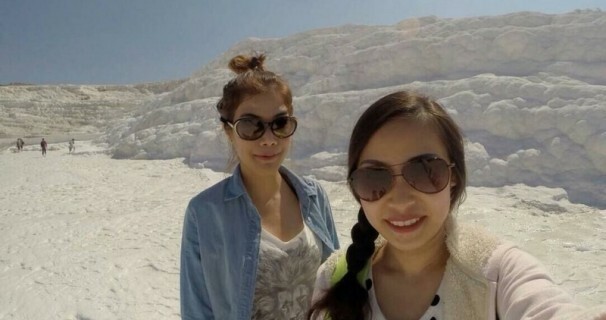 Check in to Day-Room to relaxing, refreshing then have breakfast and prepare your self for a magical day tour which we will depart from your hotel at 09:30to 10:00am to Historical and Natural Beauties of Pamukkale. We finish the tour with a visit to the Travertines (white calcium pools) where you will have time to take pictures and wade in the water. After leaving the site, we will have a late lunch, and then you will be dropped back to your hotel. *** You can continue to Ephesus ( Kusadasi or Selcuk).